The Buenos Aires meeting of finance ministers and central bank governors of the world's 20 biggest economies was meant to discuss a brightening economic outlook, the future of work, cryptocurrencies like bitcoin, and corporate tax avoidance. But trade dominated the discussions after President Donald Trump on March 8 announced global tariffs of 25 percent on steel and 10 percent on aluminium. Trump is expected on Friday to announce new tariffs on up to $60 billion (£42.7 billion) worth of Chinese technology and consumer goods annually, to punish Beijing over its drive to acquire U.S. intellectual property, sources told Reuters. Others at the G20 meeting shared Europe's concerns. "There is a solid understanding among the global community that free trade is important," Haruhiko Kuroda, Japan's central bank governor, told reporters. The U.S. steel and aluminium tariffs have raised global alarm that the U.S. would dismantle the trading system based on World Trade Organization rules in favour of unilateral actions. "I've been clear with (U.S. Treasury Secretary) Steve Mnuchin that we are waiting for a full exemption from these new American tariffs for the European Union as a whole," French Finance Minister Bruno Le Maire told reporters. "I think we should reach that goal. It's difficult (but) it's not out of reach," he added. The broad anti-China tariffs and investment restrictions under consideration as part of a U.S. intellectual property probe have raised concerns that retaliation could hit world trade and choke off the strongest global growth since the G20 head of state summits began during the financial crisis a decade ago. 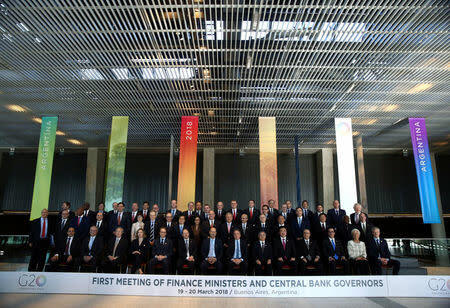 An early draft of the G20 communique seen by Reuters contained the phrase that G20 finance ministers stood by an agreement reached by their leaders in July last year in Hamburg. That agreement said: "We note the importance of bilateral, regional and plurilateral agreements being open, transparent, inclusive and WTO-consistent, and commit to working to ensure they complement the multilateral trade agreements." The Hamburg agreement, signed by all G20 leaders including Trump, said G20 countries would fight protectionism, including all unfair trade practices, although it also said they recognise the role of "legitimate trade defence instruments." "The problem is that everybody understands the Hamburg wording differently," a senior European official said.